Hello! For a couple of month's now I've been mentioning Stitch Fix in my Fashion Posts with the promise of telling you all about it in a future post. Well, since I just received my new 'Fix', I thought today would be the perfect day to explain what Stitch Fix is all about for those who have never heard of it before. Stitch Fix is basically an on-line company where you get clothes picked specifically for you by a stylist. You can arrange to have monthly 'fixes' or just schedule a fix whenever you like, which is what I do. When you sign up for Stitch Fix, they ask a lot of questions like what is your bra size, your shape, what size you normally wear in clothing, etc. Then you look through a series of pictures of clothing and you rate those pictures as to whether you love those items, or dislike them: this is to give them a sense of your clothing style. But you can also request to be 'surprised' by a clothing item you would never normally choose for yourself, which is what I did. The price for the fix varies for everyone, you pick what price range you are willing to pay for the clothes. It also costs $20.00 for your fix, which is waived if you keep everything. You can send anything back that you don't like. Now the question your probably wondering, is why did I choose to try Stitch Fix. Well, most people do Stitch Fix because they struggle with fashion and need a little help. For me, it's a couple of different reasons. First, is time: as much as I LOVE TO SHOP, I'm very busy and I don't have the luxury of having a full day to spend at the mall trying on clothes. So it is nice to have someone do the shopping for me. Secondly, I tend to keep buying the same 'style' of clothes over and over again. Stitch Fix takes me out of my style rut, and forces me to try something I otherwise would never have considered. When your 'fix' arrives, it comes in a pretty little box like this. I can't even begin to tell you how much I enjoy opening up this box every time I get one. Being the mom who has everything, I'm always buying presents for other people, but I so rarely receive presents because no one ever knows what to get to me, so they get me nothing. Therefore, I find it is really nice to get a present, that I don't know whats inside, and be 'surprised', even if I'm paying for it! LOL! Every clothing item comes with a little tag like this which shows you two possible outfits you can put together with this item. I actually keep these little cards in my purse so that if I am on a rare shopping trip, I know what to look for to go with what I already have in my closet at home. Now my first 'fix' I absolutely loved and didn't have any problems with any of my clothing pieces. This 'fix' however I wasn't as thrilled about, but I did keep everything. The reason I did was because you get a 25% discount on your total order if you keep everything, and when I did the math I realized I was financially better off if I kept everything than if I returned two items. This jacket was one of the items I wanted to return but I kept it. 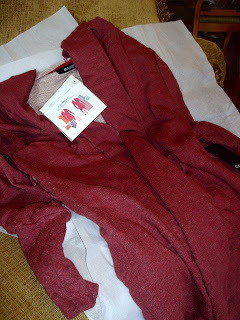 It is made of a sweatshirt material, and it is just a bit too casual and bulky for me. I also did not like the grey sweatshirt lining showing in the hood. On the card it shows wearing this with a pencil skirt (for a dressy look) but I don't think that would ever work because of the material and the grey fabric showing. It is a very warm jacket however, especially for these cool fall days when a coat would be too much and you just need a little warmth. I've already worn it to work and got some compliments on it, but I would never wear it with a skirt as a show piece item. The second item I received that I wasn't thrilled about was this navy blue silk shirt (the picture makes the shirt look periwinkle, but it's a very dark navy in real life). There is absolutely nothing wrong with this shirt, I just didn't need it. 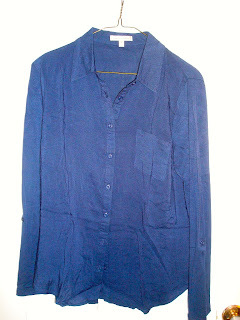 It has a lovely silky feel to it and fits me perfectly, but I already have enough similar shirts in my wardrobe. 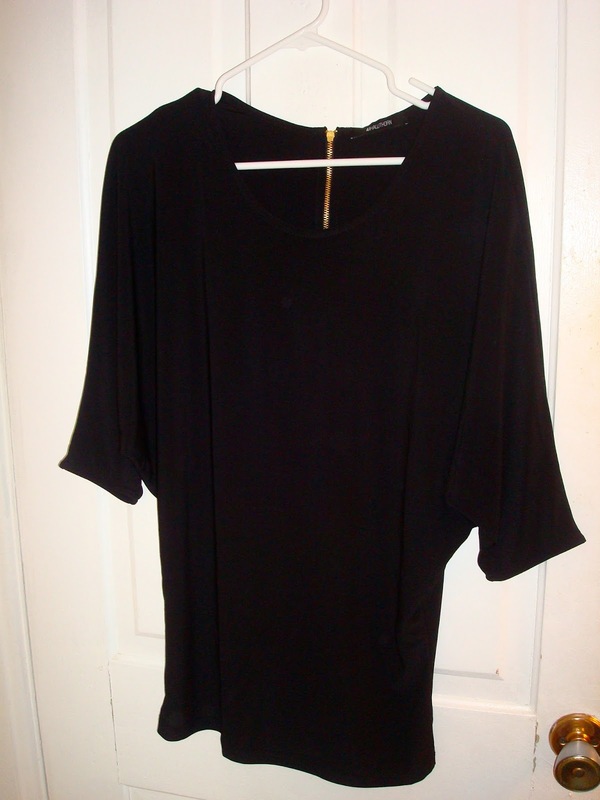 My third item was this amazing black polyester knit, exposed back zipper shirt. Now, I already have something similar to this is a sweater form in my closet, but I kept this too because I love the back zipper and the fit of this shirt is fabulous! My favorite item in this fix was this emerald green silk tunic. The color is really washed out in this photo, but it's so rich and beautiful in real life. In addition to clothes, Stitch Fix also gives you accessories. In my last fix I received a gorgeous white statement necklace (which I haven't worn yet, so I don't have a picture). In this fix, I got these beautiful geometric emerald earrings that will go beautifully with the emerald tunic or black top I received. Although I have read of other fashion bloggers who have sent things back to Stitch Fix because they didn't fit well, I have never had that issue. Everything has always fit me like a glove. Just be very honest with your size, and you probably won't have a problem. And I will eventually show you pictures of me with all of these new fall Stitchfix items in the near future. 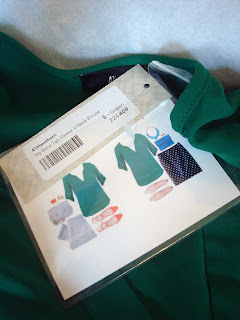 For today's post I just wanted to talk about what Stitchfix is, how it works, and what a typical package looks like. In the meantime, pictured below are two blouses I received in my first Stitch Fix when I requested comfortable travel clothes for my New Hampshire vacation. 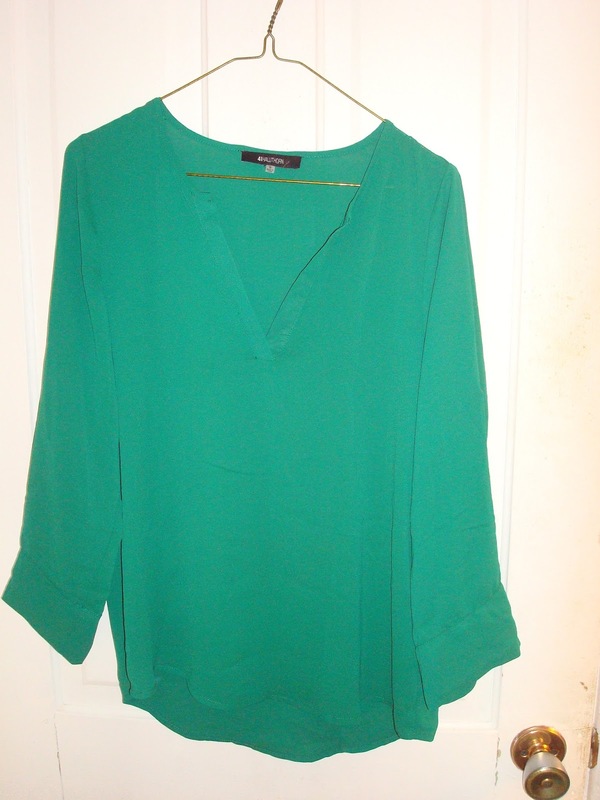 (You can see the other items I received from my first Stitch Fix HERE and HERE.) In the first photo I'm wearing a sleeveless silk blue and white shirt with dark skinnies. Stitch Fix really came through for me when I requested 'comfortable' clothing. All the materials in this fix were so soft, silky, and felt comfortable against my skin, yet, still 'dressy' which I love. I love to be comfortable, but I don't like to look comfortable. Does that make any sense? I would never wear sweat pants, simple T-Shirts, or sweat shirts out in public. Those clothing items are only for exercise or home wear for me! 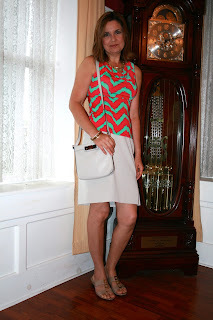 And in this picture I'm wearing another sleeveless, cowl neck, knit chevron shirt with a khaki pencil skirt from Express. Although no two 'fixes' are ever the same, I actually saw another fashion blogger wearing this very same shirt, so you may get an item someone else received; but that is no different than buying any other piece of clothing from a store, so who cares? I really love this shirt, it's hip because of the colors and chevron is so 'in' right now, and also because the material is a polyester knit, it's very 'comfortable'.....the magic word for me. I hope I've answered all your questions about Stitch Fix, if not, feel free to ask me more. Thanks for this post Amy, I was wondering about it when you mentioned it before. It really is a great idea, would be perfect for me too, because I hate to shop (can never find things!). But I looked into it and unfortunately it is out of my budget.